Download "INSURANCE KEY FEATURES OF: INCOME PROTECTION BENEFIT PLAN. This is an important document which you should keep in a safe place." 1 INSURANCE KEY FEATURES OF: INCOME PROTECTION BENEFIT PLAN This is an important document which you should keep in a safe place. 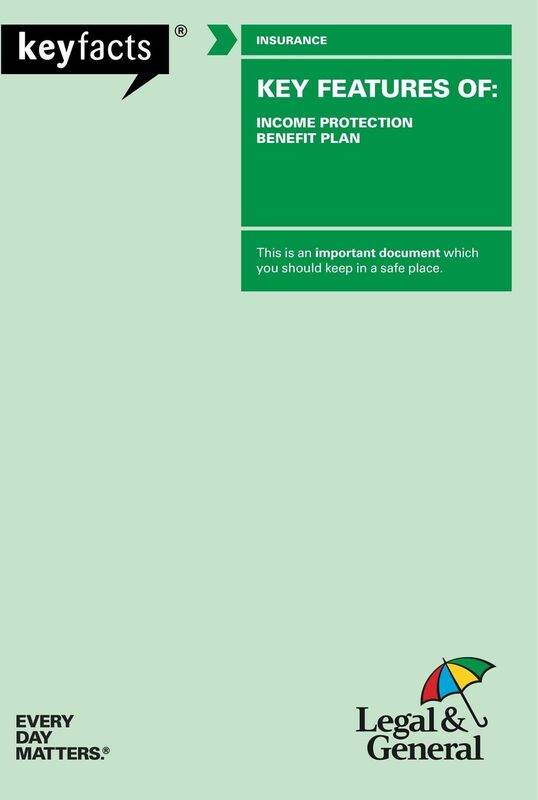 2 2 LEGAL & GENERAL PROTECTION PLANS KEY FEATURES USING THIS DOCUMENT. WHAT ARE KEY FEATURES? The Financial Conduct Authority, the independent financial services regulator requires us, Legal & General, to give you this important information to help you decide whether our Income Protection Benefit Plan is right for you. You should read this document carefully so that you understand what you are buying, and then keep it safe for future reference. OTHER DOCUMENTS You should read this document alongside your Personal Illustration. You can also ask your financial adviser for a copy of the Policy Terms and Conditions. If you are visually impaired, and would like this document in Braille, large print or audiotape, copies are available from our Helpdesk. 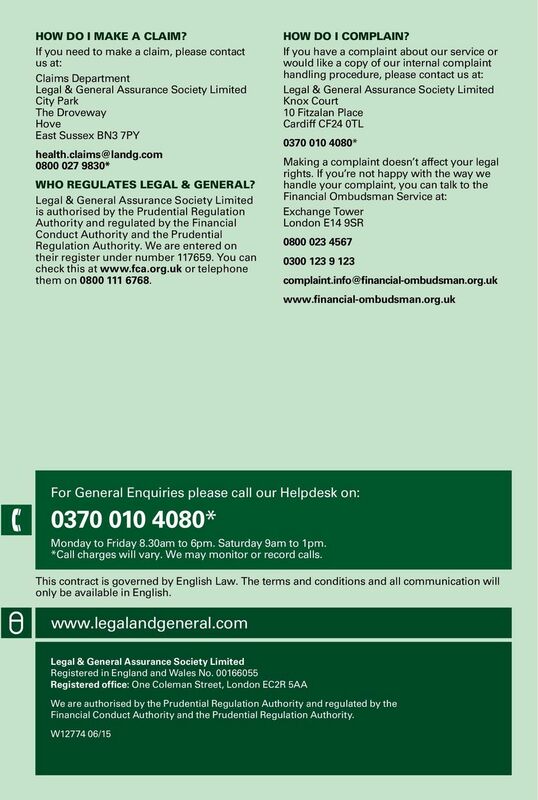 ABOUT LEGAL & GENERAL The Legal & General Group, established in 1836, is one of the UK s leading financial services groups. As at 31 December 2014, the value of our assets under management across the group, based on current economic conditions, is 710 billion. We have over nine million customers in the UK for our life assurance, pensions, investments and general insurance plans. 3 LEGAL & GENERAL PROTECTION PLANS KEY FEATURES 3 AIMS Our Income Protection Benefit Plan is designed to help protect against the financial impact of your incapacity on you or your family s lifestyle during the length of the policy. The policy is designed to pay you a regular monthly benefit if you can t work due to incapacity caused by an illness or an injury and which results in a loss of earnings. This policy can help towards your everyday living expenses if you work less than 16 hours per week, are not in paid employment or are not working at the time of claim, we will consider you to be a houseperson. If you return to work after a claim, your cover will continue until the policy ends or you die, whichever comes first. YOUR COMMITMENT You must give us full and accurate information before your policy starts. Please don t assume that we ll contact your doctor to ask about your full medical details. You need to let us know if any information you gave us in your application changes before your policy starts. You must pay all the premiums due during the length of the policy. When you become incapacitated there is an initial period of time when we don t pay a monthly benefit which we call the deferred period. If you have a four week deferred period, you must tell us of any claim within two weeks of becoming incapacitated. Otherwise, you must tell us within four weeks. If you don t do this we may not backdate your claim. You must select the monthly benefit you need and review this regularly to make sure that you have enough for your needs, but not more than we ll pay. Full details available on page 5. RISKS If you stop paying your premiums, your cover will end after 30 days. However, if you make a claim under your policy and are receiving a monthly benefit, you won t have to pay your premiums. If you don t review your policy regularly, there could come a time when your cover is not enough to meet your needs. If your earnings do not support your chosen cover and/or you receive continuing income, your monthly benefit may be reduced at the time of claim. If this happens, we will not refund any difference in premiums. The monthly benefit may affect your claim to some means-tested State benefits. Your entitlement to employment related non-means tested State benefits (such as contributory Employment and Support Allowance) shouldn t be affected. However, State benefit rules may change. The monthly benefit we pay out under your policy may affect your claim to benefits paid out under other income protection policies. Tax laws may change which could affect the monthly benefit your policy pays out. We won t pay the monthly benefit or Hospitalisation Benefit for any incapacity arising from or aggravated by: alcohol and/or solvent abuse or the taking of drugs (unless these drugs were prescribed by a registered doctor in the UK) any other exclusions as specified in your Policy Schedule. If this applies we ll tell you before the policy starts. This policy does not include unemployment cover, and therefore will not pay out if you become unemployed. For more information, please speak to your financial adviser or read the Policy Terms and Conditions. 4 4 LEGAL & GENERAL PROTECTION PLANS KEY FEATURES QUESTIONS AND ANSWERS. HOW DO WE DEFINE INCAPACITY? The definition that applies to you will be shown in your Policy Schedule and will depend on your employment status and whether you re paid for your work. To claim your monthly benefit you must be under appropriate medical treatment and not doing any other work. If you work more than 16 hours per week, and are paid for your work, your incapacity definition will be own occupation. This means if, due to illness or injury, you re unable to work in your own occupation and you re not following any other occupation, we ll consider you to be incapacitated. If you work less than 16 hours per week, are not in paid employment or are not working at the time of claim, we will consider you to be a houseperson. 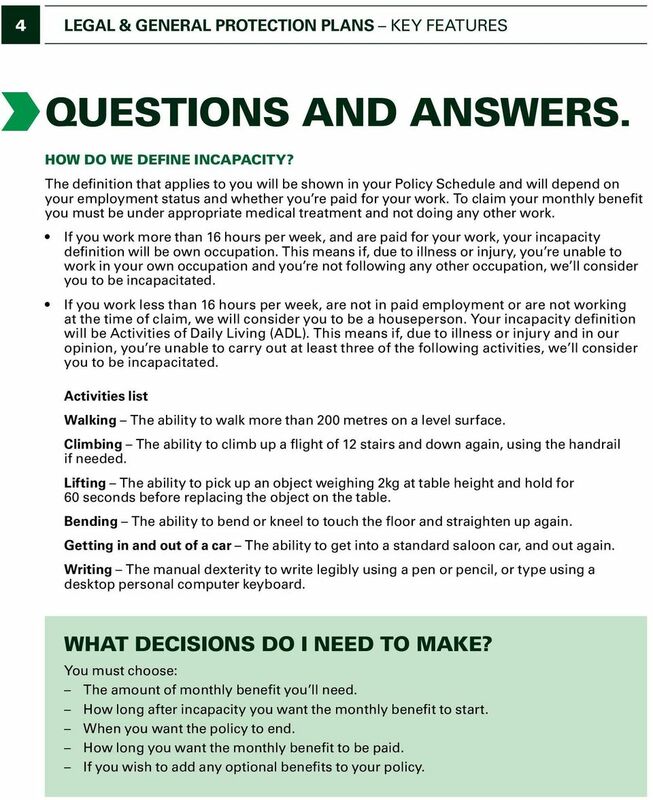 Your incapacity definition will be Activities of Daily Living (ADL). This means if, due to illness or injury and in our opinion, you re unable to carry out at least three of the following activities, we ll consider you to be incapacitated. Activities list Walking The ability to walk more than 200 metres on a level surface. Climbing The ability to climb up a flight of 12 stairs and down again, using the handrail if needed. Lifting The ability to pick up an object weighing 2kg at table height and hold for 60 seconds before replacing the object on the table. Bending The ability to bend or kneel to touch the floor and straighten up again. Getting in and out of a car The ability to get into a standard saloon car, and out again. Writing The manual dexterity to write legibly using a pen or pencil, or type using a desktop personal computer keyboard. WHAT DECISIONS DO I NEED TO MAKE? You must choose: The amount of monthly benefit you ll need. How long after incapacity you want the monthly benefit to start. When you want the policy to end. How long you want the monthly benefit to be paid. If you wish to add any optional benefits to your policy. 5 LEGAL & GENERAL PROTECTION PLANS KEY FEATURES 5 THE AMOUNT OF MONTHLY BENEFIT YOU LL NEED HOW DO YOU CALCULATE THE MAXIMUM MONTHLY BENEFIT THAT YOU CAN QUALIFY FOR BASED ON YOUR CURRENT EARNINGS? The table below shows how to calculate the maximum monthly benefit that you can qualify for at the start of your policy. If you re unsure how much cover you need please see your financial adviser. We do not cover 100% of your total gross earnings because currently tax and national insurance are not deducted from your monthly benefit. When you choose your cover, remember that if you need to claim we ll calculate the maximum monthly benefit at claim based on your earnings immediately before you are incapacitated. 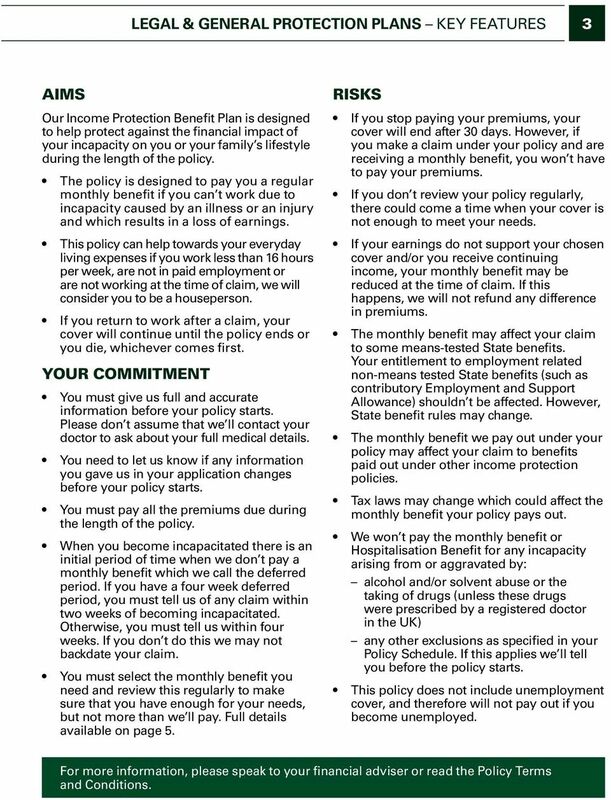 Please see the Policy Terms and Conditions for further information on how we review your earnings at claim stage. 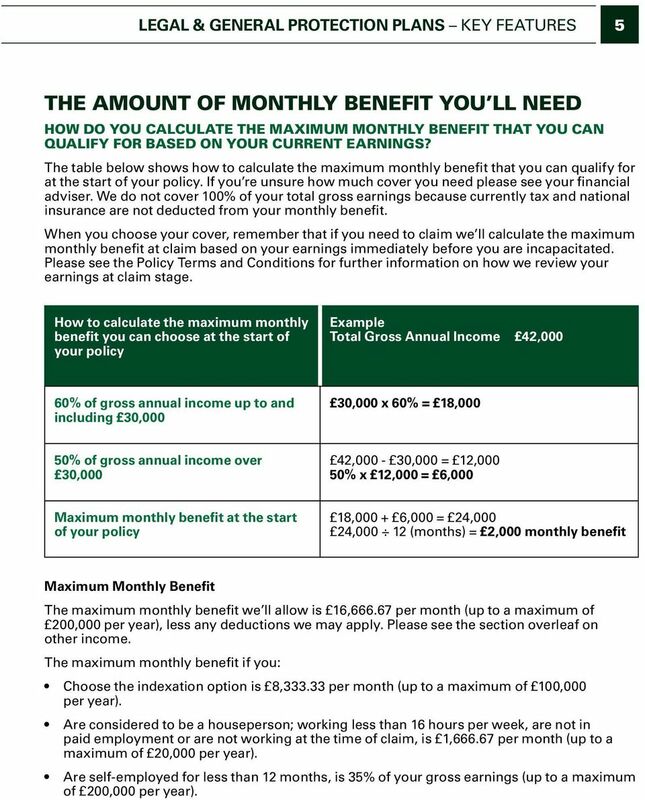 How to calculate the maximum monthly benefit you can choose at the start of your policy Example Total Gross Annual Income = 42,000 60% of gross annual income up to and including 30,000 30,000 x 60% = 18,000 &.c 50% of gross annual income over 30,000 42,000-30,000 = 12,000 50% x 12,000 = 6,000 Maximum monthly benefit at the start of your policy 18, ,000 = 24,000 24, (months) = 2,000 monthly benefit Maximum Monthly Benefit The maximum monthly benefit we ll allow is 16, per month (up to a maximum of 200,000 per year), less any deductions we may apply. Please see the section overleaf on other income. The maximum monthly benefit if you: Choose the indexation option is 8, per month (up to a maximum of 100,000 per year). Are considered to be a houseperson; working less than 16 hours per week, are not in paid employment or are not working at the time of claim, is 1, per month (up to a maximum of 20,000 per year). Are self-employed for less than 12 months, is 35% of your gross earnings (up to a maximum of 200,000 per year). 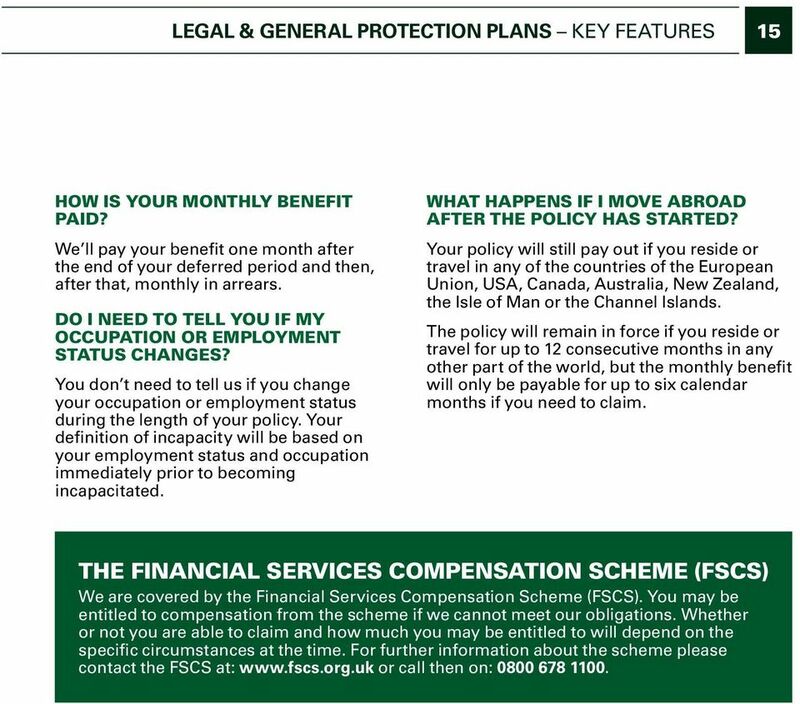 6 6 LEGAL & GENERAL PROTECTION PLANS KEY FEATURES HOW DOES MY EMPLOYMENT STATUS AFFECT THE MONTHLY BENEFIT CALCULATION? When you choose your monthly benefit, remember that if you need to claim we ll pay the monthly benefit that is based on your earnings immediately before you were incapacitated. 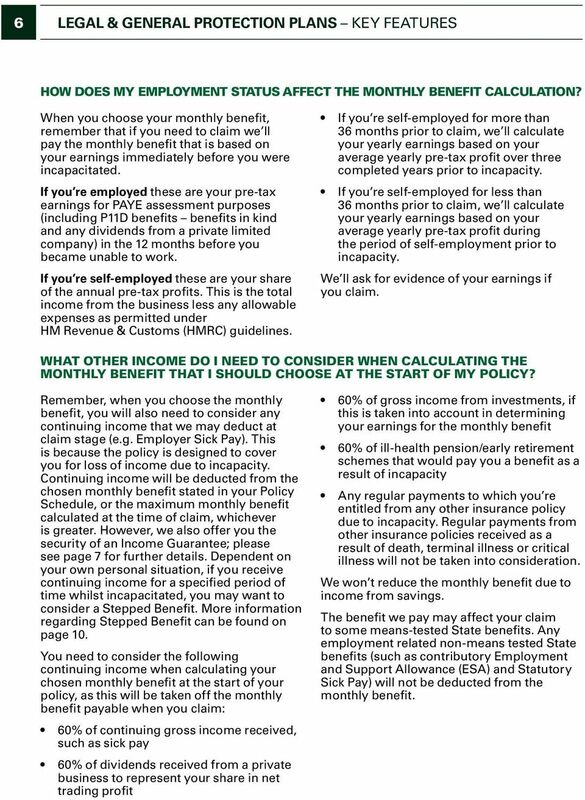 If you re employed these are your pre-tax earnings for PAYE assessment purposes (including P11D benefits benefits in kind and any dividends from a private limited company) in the 12 months before you became unable to work. If you re self-employed these are your share of the annual pre-tax profits. This is the total income from the business less any allowable expenses as permitted under HM Revenue & Customs (HMRC) guidelines. If you re self-employed for more than 36 months prior to claim, we ll calculate your yearly earnings based on your average yearly pre-tax profit over three completed years prior to incapacity. If you re self-employed for less than 36 months prior to claim, we ll calculate your yearly earnings based on your average yearly pre-tax profit during the period of self-employment prior to incapacity. We ll ask for evidence of your earnings if you claim. 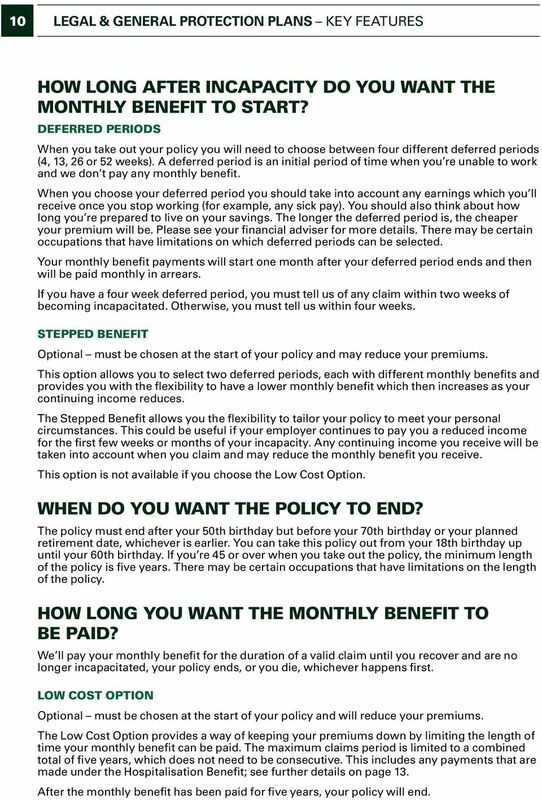 WHAT OTHER INCOME DO I NEED TO CONSIDER WHEN CALCULATING THE MONTHLY BENEFIT THAT I SHOULD CHOOSE AT THE START OF MY POLICY? Remember, when you choose the monthly benefit, you will also need to consider any continuing income that we may deduct at claim stage (e.g. Employer Sick Pay). This is because the policy is designed to cover you for loss of income due to incapacity. Continuing income will be deducted from the chosen monthly benefit stated in your Policy Schedule, or the maximum monthly benefit calculated at the time of claim, whichever is greater. However, we also offer you the security of an Income Guarantee; please see page 7 for further details. Dependent on your own personal situation, if you receive continuing income for a specified period of time whilst incapacitated, you may want to consider a Stepped Benefit. More information regarding Stepped Benefit can be found on page 10. You need to consider the following continuing income when calculating your chosen monthly benefit at the start of your policy, as this will be taken off the monthly benefit payable when you claim: 60% of continuing gross income received, such as sick pay 60% of dividends received from a private business to represent your share in net trading profit 60% of gross income from investments, if this is taken into account in determining your earnings for the monthly benefit 60% of ill-health pension/early retirement schemes that would pay you a benefit as a result of incapacity Any regular payments to which you re entitled from any other insurance policy due to incapacity. Regular payments from other insurance policies received as a result of death, terminal illness or critical illness will not be taken into consideration. We won t reduce the monthly benefit due to income from savings. The benefit we pay may affect your claim to some means-tested State benefits. Any employment related non-means tested State benefits (such as contributory Employment and Support Allowance (ESA) and Statutory Sick Pay) will not be deducted from the monthly benefit. 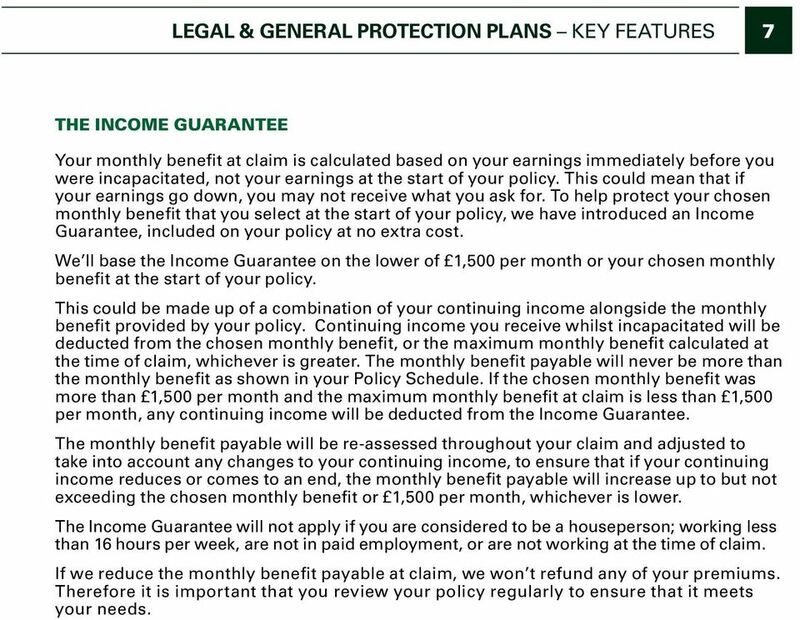 7 LEGAL & GENERAL PROTECTION PLANS KEY FEATURES 7 THE INCOME GUARANTEE Your monthly benefit at claim is calculated based on your earnings immediately before you were incapacitated, not your earnings at the start of your policy. This could mean that if your earnings go down, you may not receive what you ask for. To help protect your chosen monthly benefit that you select at the start of your policy, we have introduced an Income Guarantee, included on your policy at no extra cost. We ll base the Income Guarantee on the lower of 1,500 per month or your chosen monthly benefit at the start of your policy. This could be made up of a combination of your continuing income alongside the monthly benefit provided by your policy. Continuing income you receive whilst incapacitated will be deducted from the chosen monthly benefit, or the maximum monthly benefit calculated at the time of claim, whichever is greater. The monthly benefit payable will never be more than the monthly benefit as shown in your Policy Schedule. If the chosen monthly benefit was more than 1,500 per month and the maximum monthly benefit at claim is less than 1,500 per month, any continuing income will be deducted from the Income Guarantee. The monthly benefit payable will be re-assessed throughout your claim and adjusted to take into account any changes to your continuing income, to ensure that if your continuing income reduces or comes to an end, the monthly benefit payable will increase up to but not exceeding the chosen monthly benefit or 1,500 per month, whichever is lower. The Income Guarantee will not apply if you are considered to be a houseperson; working less than 16 hours per week, are not in paid employment, or are not working at the time of claim. If we reduce the monthly benefit payable at claim, we won t refund any of your premiums. Therefore it is important that you review your policy regularly to ensure that it meets your needs. 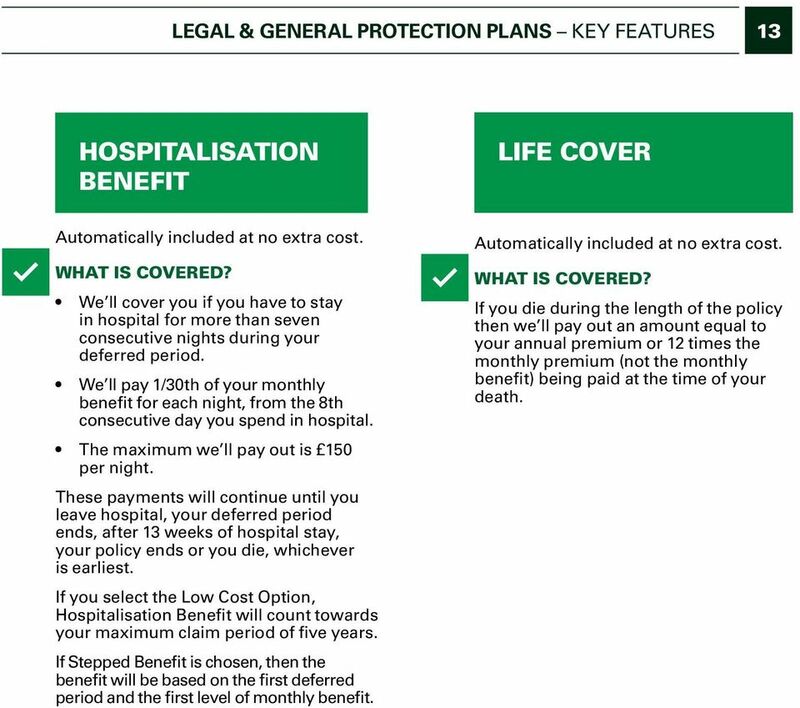 8 8 LEGAL & GENERAL PROTECTION PLANS KEY FEATURES WORKING EXAMPLE SCENARIO 1 Peter earns 28,000 a year. 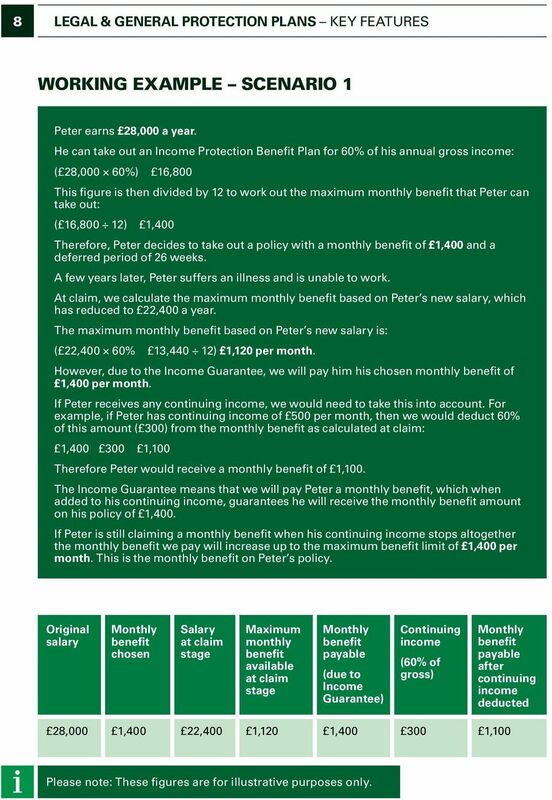 He can take out an Income Protection Benefit Plan for 60% of his annual gross income: ( 28,000 60%) = 16,800 This figure is then divided by 12 to work out the maximum monthly benefit that Peter can take out: ( 16,800 12) = 1,400 Therefore, Peter decides to take out a policy with a monthly benefit of 1,400 and a deferred period of 26 weeks. A few years later, Peter suffers an illness and is unable to work. At claim, we calculate the maximum monthly benefit based on Peter s new salary, which has reduced to 22,400 a year. The maximum monthly benefit based on Peter s new salary is: ( 22,400 60% = 13,440 12) 1,120 per month. However, due to the Income Guarantee, we will pay him his chosen monthly benefit of 1,400 per month. If Peter receives any continuing income, we would need to take this into account. For example, if Peter has continuing income of 500 per month, then we would deduct 60% of this amount ( 300) from the monthly benefit as calculated at claim: 1, = 1,100 Therefore Peter would receive a monthly benefit of 1,100. The Income Guarantee means that we will pay Peter a monthly benefit, which when added to his continuing income, guarantees he will receive the monthly benefit amount on his policy of 1,400. If Peter is still claiming a monthly benefit when his continuing income stops altogether the monthly benefit we pay will increase up to the maximum benefit limit of 1,400 per month. This is the monthly benefit on Peter s policy. Original salary Monthly benefit chosen Salary at claim stage Maximum monthly benefit available at claim stage Monthly benefit payable (due to Income Guarantee) Continuing income (60% of gross) Monthly benefit payable after continuing income deducted 28,000 1,400 22,400 1,120 1, ,100 Please note: These figures are for illustrative purposes only. 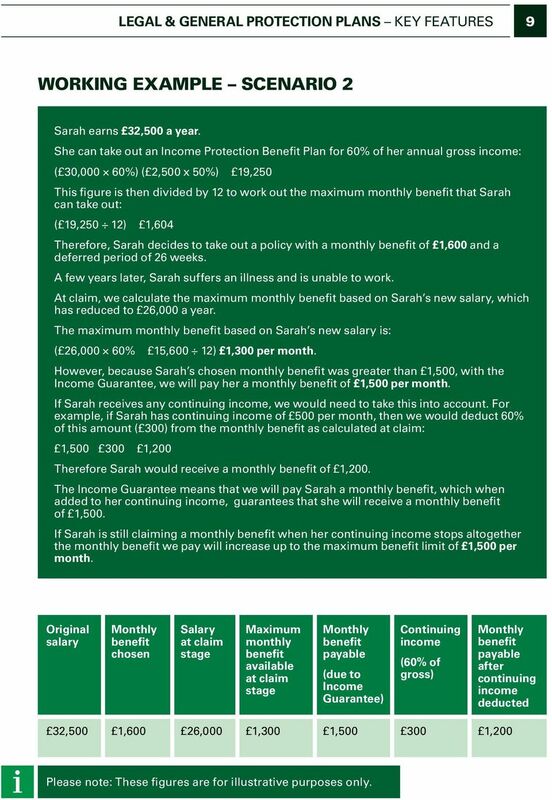 9 LEGAL & GENERAL PROTECTION PLANS KEY FEATURES 9 WORKING EXAMPLE SCENARIO 2 Sarah earns 32,500 a year. She can take out an Income Protection Benefit Plan for 60% of her annual gross income: ( 30,000 60%) ( 2,500 x 50%) = 19,250 This figure is then divided by 12 to work out the maximum monthly benefit that Sarah can take out: ( 19,250 12) = 1,604 Therefore, Sarah decides to take out a policy with a monthly benefit of 1,600 and a deferred period of 26 weeks. A few years later, Sarah suffers an illness and is unable to work. At claim, we calculate the maximum monthly benefit based on Sarah s new salary, which has reduced to 26,000 a year. The maximum monthly benefit based on Sarah s new salary is: ( 26,000 60% = 15,600 12) 1,300 per month. However, because Sarah s chosen monthly benefit was greater than 1,500, with the Income Guarantee, we will pay her a monthly benefit of 1,500 per month. If Sarah receives any continuing income, we would need to take this into account. For example, if Sarah has continuing income of 500 per month, then we would deduct 60% of this amount ( 300) from the monthly benefit as calculated at claim: 1, = 1,200 Therefore Sarah would receive a monthly benefit of 1,200. The Income Guarantee means that we will pay Sarah a monthly benefit, which when added to her continuing income, guarantees that she will receive a monthly benefit of 1,500. If Sarah is still claiming a monthly benefit when her continuing income stops altogether the monthly benefit we pay will increase up to the maximum benefit limit of 1,500 per month. Original salary Monthly benefit chosen Salary at claim stage Maximum monthly benefit available at claim stage Monthly benefit payable (due to Income Guarantee) Continuing income (60% of gross) Monthly benefit payable after continuing income deducted 32,500 1,600 26,000 1,300 1, ,200 Please note: These figures are for illustrative purposes only. 10 10 LEGAL & GENERAL PROTECTION PLANS KEY FEATURES HOW LONG AFTER INCAPACITY DO YOU WANT THE MONTHLY BENEFIT TO START? DEFERRED PERIODS When you take out your policy you will need to choose between four different deferred periods (4, 13, 26 or 52 weeks). A deferred period is an initial period of time when you re unable to work and we don t pay any monthly benefit. When you choose your deferred period you should take into account any earnings which you ll receive once you stop working (for example, any sick pay). You should also think about how long you re prepared to live on your savings. The longer the deferred period is, the cheaper your premium will be. Please see your financial adviser for more details. There may be certain occupations that have limitations on which deferred periods can be selected. Your monthly benefit payments will start one month after your deferred period ends and then will be paid monthly in arrears. If you have a four week deferred period, you must tell us of any claim within two weeks of becoming incapacitated. Otherwise, you must tell us within four weeks. STEPPED BENEFIT Optional must be chosen at the start of your policy and may reduce your premiums. This option allows you to select two deferred periods, each with different monthly benefits and provides you with the flexibility to have a lower monthly benefit which then increases as your continuing income reduces. The Stepped Benefit allows you the flexibility to tailor your policy to meet your personal circumstances. This could be useful if your employer continues to pay you a reduced income for the first few weeks or months of your incapacity. Any continuing income you receive will be taken into account when you claim and may reduce the monthly benefit you receive. This option is not available if you choose the Low Cost Option. WHEN DO YOU WANT THE POLICY TO END? The policy must end after your 50th birthday but before your 70th birthday or your planned retirement date, whichever is earlier. You can take this policy out from your 18th birthday up until your 60th birthday. If you re 45 or over when you take out the policy, the minimum length of the policy is five years. There may be certain occupations that have limitations on the length of the policy. HOW LONG YOU WANT THE MONTHLY BENEFIT TO BE PAID? We ll pay your monthly benefit for the duration of a valid claim until you recover and are no longer incapacitated, your policy ends, or you die, whichever happens first. LOW COST OPTION Optional must be chosen at the start of your policy and will reduce your premiums. The Low Cost Option provides a way of keeping your premiums down by limiting the length of time your monthly benefit can be paid. The maximum claims period is limited to a combined total of five years, which does not need to be consecutive. This includes any payments that are made under the Hospitalisation Benefit; see further details on page 13. After the monthly benefit has been paid for five years, your policy will end. 11 LEGAL & GENERAL PROTECTION PLANS KEY FEATURES 11 WHAT BENEFITS ARE AVAILABLE? The following benefits may be available. Some of these benefits are subject to age and other restrictions. 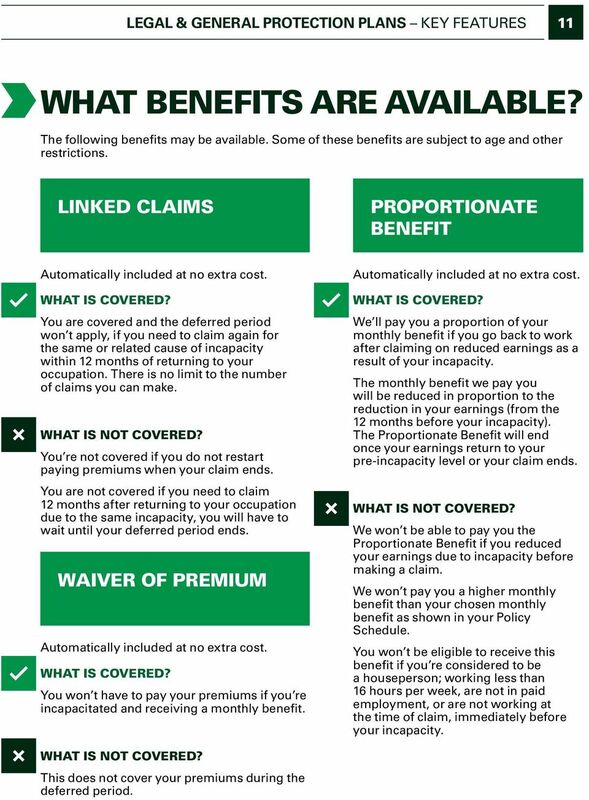 LINKED CLAIMS PROPORTIONATE BENEFIT Automatically included at no extra cost. Automatically included at no extra cost. WHAT IS COVERED? You are covered and the deferred period won t apply, if you need to claim again for the same or related cause of incapacity within 12 months of returning to your occupation. There is no limit to the number of claims you can make. WHAT IS NOT COVERED? You re not covered if you do not restart paying premiums when your claim ends. WHAT IS COVERED? We ll pay you a proportion of your monthly benefit if you go back to work after claiming on reduced earnings as a result of your incapacity. The monthly benefit we pay you will be reduced in proportion to the reduction in your earnings (from the 12 months before your incapacity). The Proportionate Benefit will end once your earnings return to your pre-incapacity level or your claim ends. You are not covered if you need to claim 12 months after returning to your occupation WHAT IS NOT COVERED? due to the same incapacity, you will have to wait until your deferred period ends. WAIVER OF PREMIUM Automatically included at no extra cost. WHAT IS COVERED? You won t have to pay your premiums if you re incapacitated and receiving a monthly benefit. WHAT IS NOT COVERED? This does not cover your premiums during the deferred period. We won t be able to pay you the Proportionate Benefit if you reduced your earnings due to incapacity before making a claim. 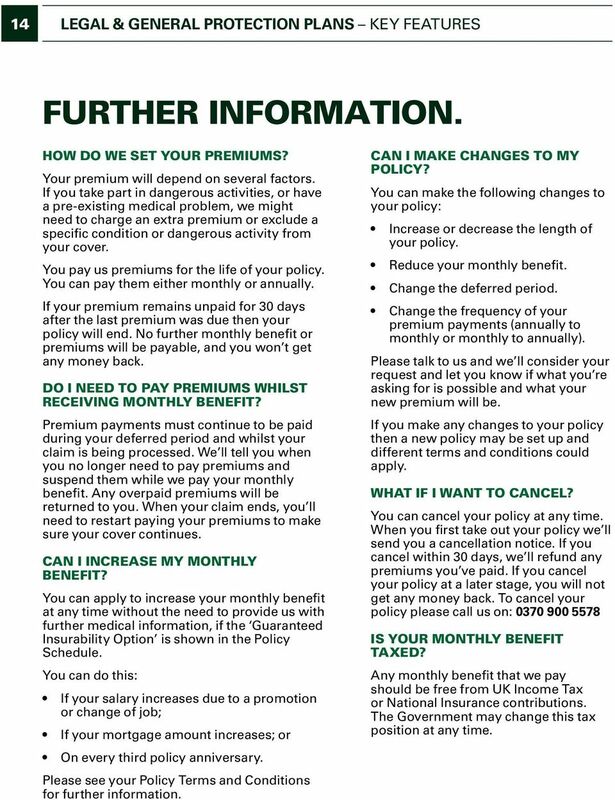 We won t pay you a higher monthly benefit than your chosen monthly benefit as shown in your Policy Schedule. You won t be eligible to receive this benefit if you re considered to be a houseperson; working less than 16 hours per week, are not in paid employment, or are not working at the time of claim, immediately before your incapacity. 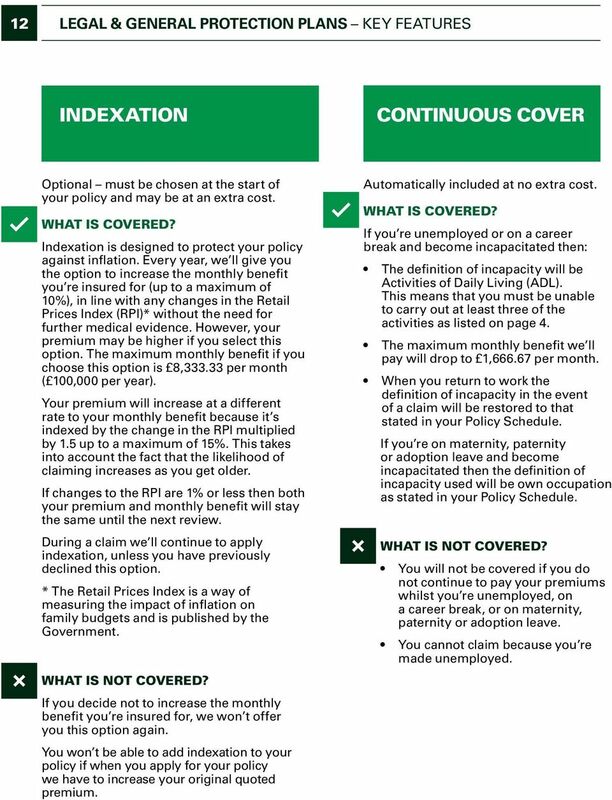 12 12 LEGAL & GENERAL PROTECTION PLANS KEY FEATURES INDEXATION CONTINUOUS COVER Optional must be chosen at the start of your policy and may be at an extra cost. WHAT IS COVERED? Indexation is designed to protect your policy against inflation. Every year, we ll give you the option to increase the monthly benefit you re insured for (up to a maximum of 10%), in line with any changes in the Retail Prices Index (RPI)* without the need for further medical evidence. However, your premium may be higher if you select this option. The maximum monthly benefit if you choose this option is 8, per month ( 100,000 per year). Your premium will increase at a different rate to your monthly benefit because it s indexed by the change in the RPI multiplied by 1.5 up to a maximum of 15%. This takes into account the fact that the likelihood of claiming increases as you get older. If changes to the RPI are 1% or less then both your premium and monthly benefit will stay the same until the next review. During a claim we ll continue to apply indexation, unless you have previously declined this option. * The Retail Prices Index is a way of measuring the impact of inflation on family budgets and is published by the Government. WHAT IS NOT COVERED? If you decide not to increase the monthly benefit you re insured for, we won t offer you this option again. You won t be able to add indexation to your policy if when you apply for your policy we have to increase your original quoted premium. Automatically included at no extra cost. WHAT IS COVERED? If you re unemployed or on a career break and become incapacitated then: The definition of incapacity will be Activities of Daily Living (ADL). This means that you must be unable to carry out at least three of the activities as listed on page 4. The maximum monthly benefit we ll pay will drop to 1, per month. When you return to work the definition of incapacity in the event of a claim will be restored to that stated in your Policy Schedule. If you re on maternity, paternity or adoption leave and become incapacitated then the definition of incapacity used will be own occupation as stated in your Policy Schedule. WHAT IS NOT COVERED? You will not be covered if you do not continue to pay your premiums whilst you re unemployed, on a career break, or on maternity, paternity or adoption leave. You cannot claim because you re made unemployed. 13 LEGAL & GENERAL PROTECTION PLANS KEY FEATURES 13 HOSPITALISATION BENEFIT LIFE COVER Automatically included at no extra cost. WHAT IS COVERED? We ll cover you if you have to stay in hospital for more than seven consecutive nights during your deferred period. We ll pay 1/30th of your monthly benefit for each night, from the 8th consecutive day you spend in hospital. The maximum we ll pay out is 150 per night. These payments will continue until you leave hospital, your deferred period ends, after 13 weeks of hospital stay, your policy ends or you die, whichever is earliest. If you select the Low Cost Option, Hospitalisation Benefit will count towards your maximum claim period of five years. If Stepped Benefit is chosen, then the benefit will be based on the first deferred period and the first level of monthly benefit. Automatically included at no extra cost. WHAT IS COVERED? If you die during the length of the policy then we ll pay out an amount equal to your annual premium or 12 times the monthly premium (not the monthly benefit) being paid at the time of your death. 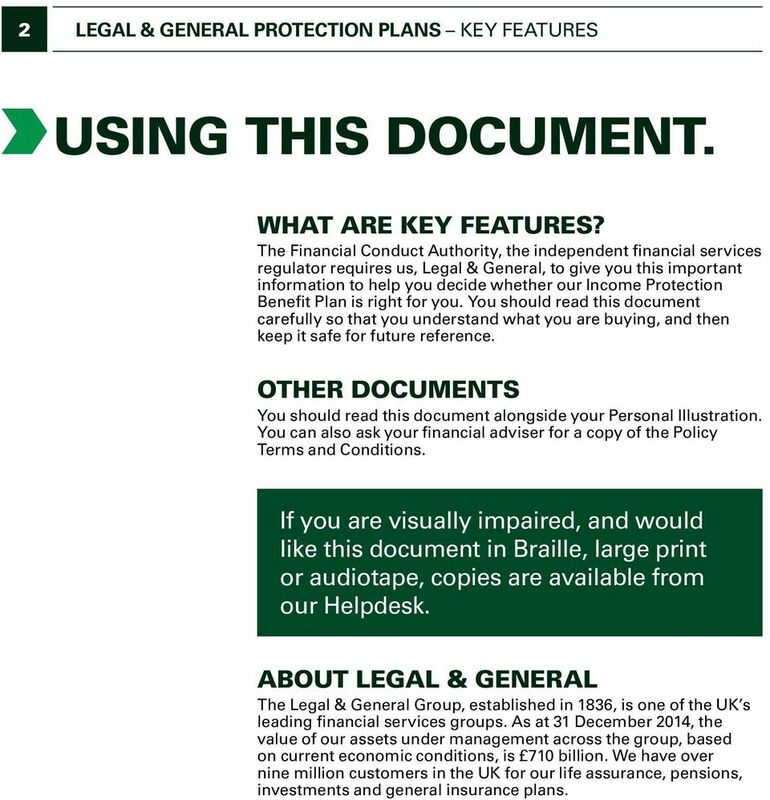 14 14 LEGAL & GENERAL PROTECTION PLANS KEY FEATURES FURTHER INFORMATION. HOW DO WE SET YOUR PREMIUMS? Your premium will depend on several factors. If you take part in dangerous activities, or have a pre-existing medical problem, we might need to charge an extra premium or exclude a specific condition or dangerous activity from your cover. You pay us premiums for the life of your policy. You can pay them either monthly or annually. If your premium remains unpaid for 30 days after the last premium was due then your policy will end. No further monthly benefit or premiums will be payable, and you won t get any money back. DO I NEED TO PAY PREMIUMS WHILST RECEIVING MONTHLY BENEFIT? Premium payments must continue to be paid during your deferred period and whilst your claim is being processed. We ll tell you when you no longer need to pay premiums and suspend them while we pay your monthly benefit. Any overpaid premiums will be returned to you. When your claim ends, you ll need to restart paying your premiums to make sure your cover continues. CAN I INCREASE MY MONTHLY BENEFIT? You can apply to increase your monthly benefit at any time without the need to provide us with further medical information, if the Guaranteed Insurability Option is shown in the Policy Schedule. You can do this: If your salary increases due to a promotion or change of job; If your mortgage amount increases; or On every third policy anniversary. Please see your Policy Terms and Conditions for further information. CAN I MAKE CHANGES TO MY POLICY? You can make the following changes to your policy: Increase or decrease the length of your policy. Reduce your monthly benefit. Change the deferred period. Change the frequency of your premium payments (annually to monthly or monthly to annually). Please talk to us and we ll consider your request and let you know if what you re asking for is possible and what your new premium will be. If you make any changes to your policy then a new policy may be set up and different terms and conditions could apply. WHAT IF I WANT TO CANCEL? You can cancel your policy at any time. When you first take out your policy we ll send you a cancellation notice. If you cancel within 30 days, we ll refund any premiums you ve paid. If you cancel your policy at a later stage, you will not get any money back. To cancel your policy please call us on: IS YOUR MONTHLY BENEFIT TAXED? Any monthly benefit that we pay should be free from UK Income Tax or National Insurance contributions. The Government may change this tax position at any time.